A fast handling shooter this carbine crossbow is hand cocked using an integrated lever. 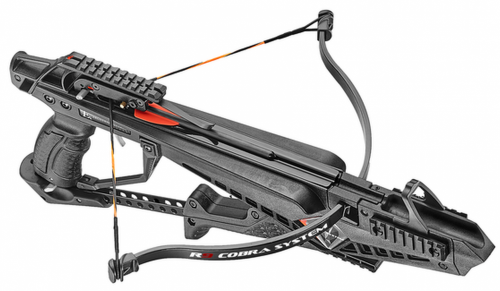 The Cobra R9's 8 inch power stroke blasts a proprietary 130 grain 7.5" carbon bolt to a velocity of 240fps, nearly double the kinetic energy of traditional pistol crossbow bolts. The 90lb limbs of the Cobra are easily removed and reinstalled allowing the crossbows to be carried and stored. This ease of disassembly also complies with law requirements that crossbows must be rendered "non-functional" during transportation. - Power Stroke : 7.5"